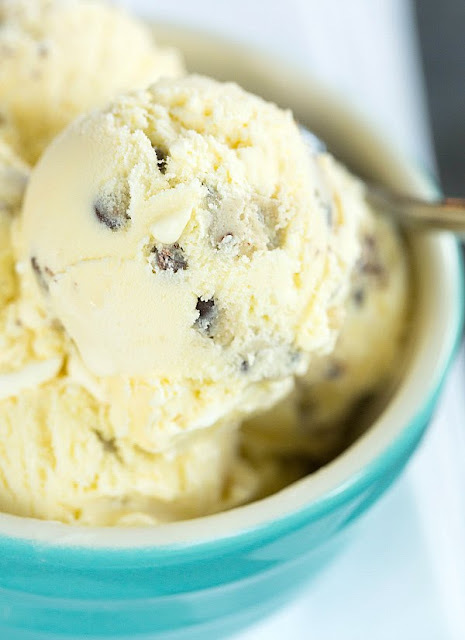 A real crowd-pleaser: creamy vanilla ice cream loaded with chunks of (eggless) chocolate chip cookie dough. You have full control over how large or small the chunks of cookie dough will be but my suggestion is to keep them bite-sized and plentiful so there will always be doughy goodness in every bite. Stir it the remaining 1 cup whipping cream and the vanilla extract and cool completely, using a ice bath if desired. Stir occasionally, until the mixture is cool. Refrigerate for at least 30 minutes, or up to 2 days. Just before churning the ice cream, scoop the cookie dough into ½-teaspoon to 1 teaspoon-sized balls and place on a plate or parchment-lined baking sheet and place in the freezer. When finished churning, fold in the chunks of cookie dough and transfer to an airtight container. Freeze until firm, at least 4 hours.